Roman Leo Brooks, Commander, born May 20,1918, Woodsfield, OH; graduated from the Naval Academy in 1940 and was assigned to duty on the USS West Virginia. At the request of Ensign Tom Ford, he exchanged watch assignments with Tom, giving Ensign Brooks the 8:00-12:00 AM watch as OOD for Dec. 7, 1941. Adm. Samuel Eliot Morison published the following account in his book, The Two-Ocean War in 1963, sub-titled: A Short History of the US Navy in the Second World War. Oklahoma lost 415 officers and men killed out of 1,354 aboard. Tennessee and West Virginia made the next couple on Battleship Row. The latter, outboard, took six or seven torpedoes, the first before 0756, and two bombs. An exceptionally well-trained crew, who loved their Wee Vee, as they called the ship, saved her from the fate of Oklahoma. Ensign Brooks, officer of the deck, saw the first bomb hit Ford Island and immediately ordered "Away Fire and Rescue Party." This brought everyone topside on the double and saved hundreds of lives. She listed so rapidly that the guns on the starboard side, which opened fire promptly, could be served only by organizing a double row of ammunition handlers, one to pass and the other to hold the passer upright. Lt. Ricketts ordered counter-flooding on his own initiative, and ably assisted by Boatswain's Mate Billingsley, corrected a 28 degree list to 15 degrees; this allowed her to settle on the bottom almost upright. Capt. Bennion, disemboweled by fragments from a bomb that exploded on Tennessee alongside, was in extremis; his only thoughts were for his ship and crew until his life flickered out a few minutes later; but his fighting spirit lived on. All hands fought fires, although frequently dive-bombed and strafed. "Their spirit was marvelous," reported the surviving executive officer. "Words fail in attempting to describe the magnificent display of courage, discipline and devotion to duty of all." West Virginia lost 105, killed out of about 1,500 on board. After leaving the USN, Mr. Brooks spent a total of 30 years with the Ford Motor Co. and the Department of Transportation (DOT). 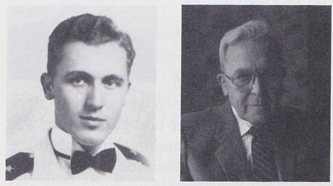 At DOT he helped develop the safety programs for motor vehicles in the defects area. This included the largest recall campaign ever issued up to that time, involving the recall of 6.5 million cars and trucks for replacement of their engine mounts. I worked with Roman for fifteen years at the National Highway Traffic Safety Administration. Roman retired about five years ago. He is still feisty. I have no idea how old he is. He used to live in Silver Spring, Maryland. Since retiring, he move to Ohio to be near his family. He never married; he was absolutely dedicated to his job, the mission of reducing the public health cost of motor vehicle crashes. He was tireless in assuring that motor vehicles and motor vehicle equipment met the Nation's motor vehicle safety standards. He was instrumental in the recall of hundreds of thousands parts related to motor vehicle lighting that were not complying with the standards. He was also responsible for the recall of thousands of items of motor vehicle equipment that were determined to have safety defects. During his career, he was always absolutely dedicated to serving the public. I feel extremely privileged to have worked with such an outstanding American.